Today, James Earl Carter, the 39th President of the United States, became the oldest living ex-president, at 94 years and 172 days. That’s especially remarkable because Carter had been diagnosed in 2015 with metastatic cancer that had spread to his brain and liver — which a few months later remarkably went into remission. Having left office at a relatively youthful 55, Carter has also spent far more time as an ex-president than any of his predecessors. He has by most accounts enjoyed one of the most successful and productive ex-presidencies, marked by internationally renowned work on projects ranging from disease eradication to election monitoring to promotion of human rights. And in fact, the length and quality of his ex-presidency has made it easy to forget how unlikely this Southern Baptist peanut farmer’s presidency was in the first place — not as likely as Donald Trump’s, to be sure, but certainly in the same neighborhood, offering a perpetual warning that in politics you just never know what might happen next. My own perspective on Carter’s political rise is that of a Georgian who was a kiddie volunteer in his first gubernatorial campaign of 1966. After narrowly losing a Democratic runoff spot to segregationist Lester Maddox (who eventually won the governorship via a vote in the state legislature, with Carter supporting him), Carter ran again in 1970 against the relatively progressive ex-governor Carl Sanders, taking a decidedly conservative-populist, and sometimes borderline racist, posture. This time he won. Carter got mixed reviews for his one term as governor (the state then prohibited consecutive terms). He did firmly renounce segregation, and appointed a significant number of African-Americans to state jobs. But he squabbled with legislators and spent an inordinate amount of time on an infinitely boring state agency consolidation project. His designated successor Bert Lance lost in 1974. Then two years later he was elected president of the United States. For those of us who had watched him closely, his astonishing ascent was like discovering that the geeky kid with braces down the street had suddenly emerged as a Hollywood leading man. When Carter announced a presidential run late in 1974, his aspirations weren’t taken very seriously in-state or nationally, particularly once a field of 16 other candidates, most of them better known that the Georgian, entered the contest in what was expected to be a banner year for Democrats. His nomination, as much of a longshot as Trump’s 40 years later, was made possible by a combination of factors, including the unexpected burnout of some supposedly can’t-miss candidates like Birch Bayh, the sidelining of Ted Kennedy by Chappaquidick, and an intense fear of George Wallace, which led many national Democrats to boost Carter until such time as he had disposed of the dangerous Alabaman (which indeed he did, deploying the clever Southern regional slogan: “Don’t send them a message; send them a president”). Carter’s unconventional young campaign manager, Hamilton Jordan, was also among the first to fully understand the new nomination contest rules and calendar that emerged when Democrats began to require popular-vote primaries or caucuses for the first time. His campaign was the first to invest heavily in Iowa, for example. Above all, though, Carter won the nomination and the general election through a sort of Greater Southern Strategy that won in states that hadn’t gone Democratic since the Civil Rights Act and would but rarely do so later — and also did well in southern-inflected border areas. He was able to do this because he attracted a unique coalition of southern white conservatives (eventually including supporters of George Wallace, who endorsed him after his nomination) and African-Americans (owing in part to the close relationship he developed with the family and former colleagues of Martin Luther King Jr.). With backing from both racists and civil rights activists, Carter briefly made the South solid for Democrats for a moment, winning his native Georgia with 67 percent of the vote after Richard Nixon had won there with 75 percent four years earlier, and winning 57 percent in Wallace’s Alabama as well. In the end Carter won every former Confederate state other than Virginia. And his candidacy inspired a fresh politicization of the white Southern evangelicals he represented, though Republicans would soon harvest the seeds he planted. Carter’s southern comfort was essential because during the course of the election year many non-southern liberals became uncomfortable with his innate conservatism and his overt evangelical religiosity. In the general election Carter managed to run behind George McGovern (the landslide Democratic loser in 1972) in many liberal areas, while losing states like Connecticut, New Jersey, Illinois and California that a more conventional Democrat might have won. Carter came close to losing an election most thought was in the bag for Democrats after Watergate, the Nixon resignation, and his pardon by Carter’s opponent Gerald Ford. Carter’s odd political career continued during his presidency. He was initially very popular, with his job approval rating peaking at 75 percent early in 1977. But his cool relations with Democratic congressional leaders and liberal interest and advocacy groups, and growing economic and foreign policy troubles, all hit hard, and by mid-1978 his approval ratings had dipped into the 30s. Gradually Ted Kennedy, who had been something of a president-in-waiting since his brother Robert’s assassination in 1968, was drawn into what at first looked like an indomitable challenge to the incumbent, particularly after Iranian students seized the U.S. embassy in Iran with 52 hostages in November 1979. But again, Carter surprised everyone with his political resiliency. Adroitly exploiting a craving for national unity in the face of international setbacks, and aggressively using the patronage powers of the presidency, he crushed Kennedy in the early primaries and all but ensured his renomination. Still, Kennedy held on, won some late contests, and as Carter’s popularity hit new lows (31 percent in mid-1980), he had to struggle against an effort to dump him at his own convention. While Carter’s not-so-narrow loss to Ronald Reagan is what people remember, that race was actually competitive until the very end, when Reagan’s reassuring debate performance drew the bulk of undecideds into his column even as independent John Anderson cut into Carter’s support from liberals. Part of his problem was that his once massive Southern regional support declined after the novelty of his original campaign faded: of the former Confederate states, only his native Georgia stayed with him against Reagan, who had his own powerful appeal to Southern conservatives. So Carter left office, largely unbeloved, to begin his long and inspiring post-presidency. But nonetheless, as improbable, Establishment-defying “outsider” politicians, the 39th and 45th presidents share some purely political characteristics, including their unorthodox paths to the White House and the turbulence of their administrations once in office. 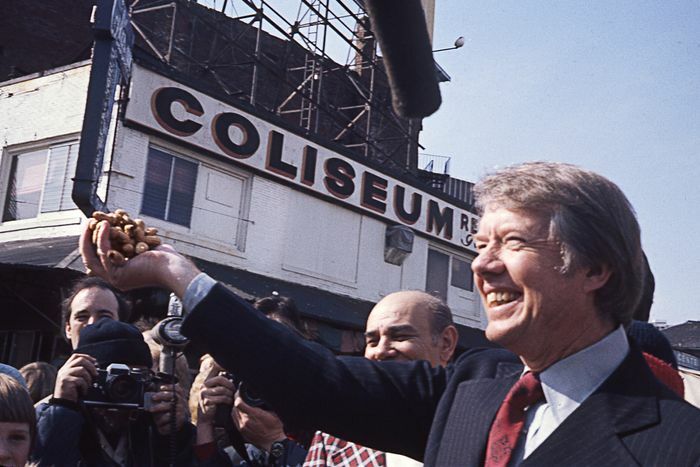 Carter’s rise to power from a large 1976 field of candidates is also instructive for those looking at the equally large 2020 Democratic field. Could a Jay Inslee or a Pete Buttigieg or a Steve Bullock come out of nowhere to navigate a demolition derby primary season and take on an incumbent Republican? Those who are sure the answer is a laughing “no” should take a long look at the career of Jimmy Carter, the former one-term governor with a meh record who came out of nowhere and put together a mind-bending coalition to win.